The purpose of the trail ride is to raise scholarship dollars for students enrolled in Southern University’s agriculture program. Sgt. Justin January, the association’s founder and president, said the group over the past four years has given out more than $5,000 in scholarship money. This year’s honorary trail bosses are Monroe Mayor Jamie Mayo and Monroe native and Minnesota Vikings All-Pro defensive lineman Pat Williams. The ride will begin at 8 a.m. so January said those interested should arrive early. January said the Trailriders’ event has grown from seven riders the first year to 55 last year counting horses, wagons and buggies. He expects more than 70 cowboys and cowgirls from Louisiana, Arkansas, Texas and Mississippi to participate in this week-long journey from Monroe to Baton Rouge. They will travel Louisiana 15 and camp in Archibald, Winnsboro, Sicily Island, Ferriday and St. Francisville.The ride is open to anyone who enjoys the outdoors and horses. This year the trail ride will make stops at Winnsboro Elementary School on Monday and Ferriday Elementary School on Wednesday to visit with children. Both stops will be between noon and 1 p.m. Anyone interested can register on site Sunday morning. The cost for participation is $10 for one day; $15 for two days; or, $35 fee for the week’s journey. For more information on the horse show, contact Christie Monroe, livestock show programs assistant director, at 225-771-2242 or christie_monroe@suagcenter.com. Horse riders and young Easter egg hunters are invited to come out to the M.A. Edmond Arena on Hwy 61 near Baker for the Southern University Ag Center's 36th Annual State and Regional Horseshow, Trail ride, and Rodeo, Saturday, April 4 at 9a.m. Gates open at 8:30a.m. Trophies will be awarded to egg hunters who find the silver, golden, and most eggs in the one-year-old to five-year-old group and the six-year-old to 10-year-old group. Participants can pet rabbits at the mini-farm before heading to the stick horse rodeo. Young riders will compete in open barrel racing, buddy pick up, and cold drink run on their stick horses. This annual event attracts more than 400 horse ranchers, riders, and ropers young and old. Trail riders from as far as Arkansas, Texas and North Louisiana will travel to the arena just in time for young riders to see an authentic horse corale and adult horse competitions. Trophies will be awarded for all youth and adult competitions. The day ends with a Blues and Zydeco Extravaganza. The event is free to children 12 years old and younger. Adults and older youth will pay a $5 gate fee. The public and media are invited to attend. *open events for all participants. For more information or to register, call Christie Monroe, assistant livestock show programs director, (225) 771-2242. Shreveport radio station interviews the Ag Center's Communities of Color Network regional coordinator Shawntell Lewis for Kick Butts Day. Great interview! Congratulations CoC Network! Shreveport farmer Rafeeq Naji has a one-track mind these days: start an organic vegetable enterprise. The native Louisianan has returned from California to manage his family farmland. Now the 60-something entrepreur has a new line of work and a new mentor in agriculture, Johnathan Jackson. Jackson, who is a 50-year veteran peach farmer, invited Naji to a national family farm conference because he was aware of the benefits he receives from attending the conference and networking with other producers and professionals. Naji, Jackson, and 43 other farmers, students, extension agents and other agricultural professionals received scholarships from the USDA Sustainable Agriculture Research and Education Program to attend the Southern Sustainable Agriculture Working Group’s 18th Annual Practical Tools and Solutions for Sustaining Family Farms conference in Chattanooga Tennessee. They traveled with the Southern University Ag Center to earlier this year. They attended educational sessions, field trips, intensive short courses, mini courses, and a USDA grantwriting workshop. The meeting consisted of farm tours and presentations on numerous topics including organic production, cut flowers, pastured poultry, goat production, and farm management. Jackson attributes his success in farming to information provided by his local extension agents. “I highly commend all extension agents for the work they do. Keep up the good work,” he said. The group traveled under the leadership of Owusu Bandele, PhD, professor, horticulture, Southern University Ag Center, and Carl Motsenbocker, PhD, professor, horticulture, LSU. The two professors served as the state coordinators. More than 1,000 conference attendees including farmers, producers, professionals, students, and vendors converged in Chattanooga, traveling from 13 states. The Morehouse Black Farmers’ Association and Southern University Ag Center held a meeting for growers on Friday, February 20, at the agricultural auditorium in Bastrop. Shane Bray presented information on corn and soybean production while Mila Berhane, Southern University Ag Center’s senior research associate, talked about vegetable production. The importance and opportunities in agriculture were discussed by April Hardie, Nathan Crisp and Nicole Woods. Lester Scott gave the overview on soybeans while Dewayne Goldmon talked about the National Black Growers Council. More than 117 individuals were in attendance. Several school children attended the meeting as well. At the end of the meeting, the group enjoyed lunch during which Tim Daniels told the group about biofuel. He showed the students plastic car parts and explained to them that agricultural products were used in making the parts. One example of an agricultural product that can be used to make plastic is sweet potato starch. SU Ag Center Odis Hill serves as extension agent in Morehouse Parish. When the Rev. 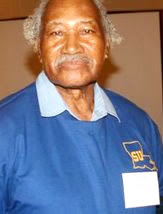 Rene F. Brown attended the Southern University Ag Center Livestock and Poultry Show last year, he returned to the Mt. Zion First Baptist in Baton Rouge with a renewed connection to agriculture and a desire to help the youth during the junior auction. The peak of the livestock show is usually the live auction, where buyers pay premium price for livestock. This year, Brown and his congregation we re present to bid on and ultimately purchase the 1,200-pound Grand Champion Steer. The church also proposed for, and won more than $7,000 of meat—two steers, three hogs, and one lamb—to feed the community, senior citizens, and members through the church’s various ministries. Now in its sixty-sixth year, the Ag Center’s livestock show remains the premiere event for youth to display showmanship and quality animals. Year round, youth prepare to compete in this culminating event by attending educational activities and programs. They learn leadership, character development, and entrepreneurship skills. Three hundred young farmers gathered at the M.A. Edmond Livestock Arena, February 26-28 for the competition and fun. More than 500 animals were exhibited, and more than 1,200 pre-schoolers attended the show and participated in the barnyard tours, said livestock show programs director Renita Marshall. Youth traveled from all over Louisiana to participate in the 2009 competition, ultimately vying for the top title of Grand Champion, and hoping to be awarded prize ribbons in the show ring. The livestock entrants individually groom and raise their animals in preparation for the show. 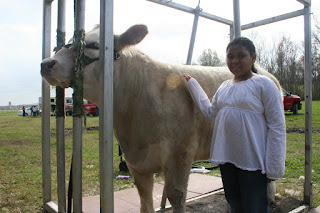 “This is the first time I had to talk to a cow this much!” said Ashley Jackson, 17, Tensas parish, who’s been showing ever since she can remember. “Sometimes you get attached to them because they have different personalities. But you still have to sell them.” Jackson, whose family is constant at livestock shows, said she enjoys participating in this show even though it is a lot of work. Two of her cattle sold during the junior auction: one for nearly $1.30 a pound and the other $2 a pound. Even if she were to travel back home with the animals, she would “still have to sell them to not lose money because at a certain age they are going to die anyway,” said Jackson who wants to attend Southern. “A lot of kids are interested in animals but they don’t know the right thing to do.” So she said she will open a large farm to the public after earning degrees in agriculture and law. The time-honored, family tradition of Southern’s show carries a strong legacy of providing an excellent opportunity for the youth of Louisiana to exhibit their prized livestock. “This exhibition has also become an important means of providing youth with valuable life skills that will prepare them for whatever career path they may choose to pursue,” said livestock show programs director Renita Marshall. “It enables them to be competitive, and develop responsibility and leadership skills.” The show featured animals that have been showcased or have won in parish competitions. During the two-day event, judges named the state champions in various breeds of beef and dairy cattle, hogs, sheep, lamb, and goats. Thirty-three youth were named state champions. Winners received premiums, rosettes, ribbons, and silver platters. The all-time favorite mini-farm, featuring a variety of small farm animals opened on Friday. Tour guides explained different animals, their food sources, farming and how agriculture affects everyone’s lives. The show also brought a livestock and poultry quiz bowl, face painting, food, craft booths, and the Hall of Louisiana Agriculture for local school groups. For these youth to have their animals purchased at premium prices is a much-needed motivation for them to continue raising livestock and pursuing careers in agriculture, said Marshall. But to see a church auction to purchase their livestock is something special. “Our hope is that (the church’s purchase) will build self-esteem and it will help them” financially, said Brown, who studied plant and soil science at Southern. “We want to encourage them to keep doing this. The Southern University Ag Center welcomes Shirley Simon to the Communities of Color Network as regions 1 and 3 coordinator. In this capacity, she works collaboratively with members of the communities, organizations and partners to increase the awareness of the harmful impact of tobacco, secondhand smoke and tobacco use cessation among Louisiana citizens. administration and a master’s degree from Xavier University in post secondary counseling education. Previously, Simon served as recruitment manager/instructor at Southern University, New Orleans, where she managed the day-to-day operations of the alternative teacher certification program until 2008. Communities of Color Network is an affiliate program of the Louisiana Tobacco-Free Living Campaign. Our friends at Lead Louisiana have encouraged their friends to attend next week's Fifth Annual Procurement Conference, "Connecting Businesses with Contracts," at the Southern University Smith-Brown Memorial Union, March 24. This meeting will give small business owners an opportunity to meet contracting officers and purchasing agents; sell your products and services to private industry, federal and state goverments. For information please call (504) 589-2756 or (504) 589-6688 or fax your registration to (337) 484-5837 or email (prs6182@louisiana.edu) not later than March 20, 2009. For other inquiries, visit http://www.suagcenter.com/ or http://www.crsbd.com/. CoC Network is an affiliated program of The Louisiana Campaign for Tobacco-Free Living. and our children, especially in the African-American community. We educate citizens how to recognize these tactics and encourage others to join the fight to reduce morbidity and mortality rates in Louisiana's communities of color." "Research proves tobacco is a life threatening issue for our families and our communities," said Gina E. Eubanks, vice chancellor for extension at SU Ag Center. "It's alarming to know that more African Americans die annually from tobacco related diseases than homicides, HIV, diabetes and accidental deaths, combined. SU Ag Center is committed to supporting the efforts of CoC Network in reducing and eradicating tobacco consumption statewide." to tobacco-free living. Our motto is CoC Network is not waiting until the smoke clears, CoC Network is clearing the smoke." For more information call 318-767-2609. The Southern University Ag Center partnered with Louisiana Health Care Review (LHCR) to hold a workshop entitled “Diabetes Empowerment Education Program.” This “Train the Trainer” event which focused on diabetes prevention and intervention was held January 15, attracting more than 20 participants. Training modules included: recognizing the human body, risk factors in diabetes, understanding diabetes, monitoring the body, managing diabetes through nutrition, complications of diabetes, physical activity: benefits and challenges, medications and medical guidelines, and coping with diabetes. At Louisiana Health Care Review, the mission is to improve the quality of health and health care by using information and collaborative relationships to enable change. They believe that better care begins with better care management. The team of health care professionals has developed solutions to significantly impact the quality of health care and to focus on performance measures for public reporting. They have developed partnerships with key stakeholders - beneficiaries, governments, providers and the communities - to make health care healthier in their service areas. LHCR’s impact has led to rapid and sustainable improvements in the quality of care, utilization and overall management of health care services. Each year, Southern University and A&M College is privileged to host the Area IV, Career Development Event. This event brings together 1,100 students from 50 high schools and 25 surrounding parishes. Youth participants in Future Farmers of America compete in ten judging contest: livestock, beef, floriculture, dairy cattle, welding, small engine, poultry, nursery and landscaping, meats, and dairy products. This event develops student's leadership ability, provide them with the opportunity to visit an 1890 land-grant institution, and enlighten them on issues that impact agriculture in the state of Louisiana. The CDE is held annually in March at Southern University and A&M College and Southern University Ag Center, M.A. Edmund Arena. Contact: Willie Rawls or William Augustine at (225) 771-2242. The winners of the Second Annual Livestock Quiz Bowl were North Central High School students: (L to R) Kristen Casse, 11th grade; Brittany Taylor, 12th grade; (Back Row) Preston Bryant – 12 grade; Matthew Stelly, team coach – North Central High School; Daleonne Smith, 12th grade. The team received awards from Gina Eubanks, Ph.D., vice chancellor for research, at left, and Renita Marshall, DVM, director, livestock show programs. Photo by Christopher Rogers. Louisiana statistics indicate that students engage in the harmful practice of smoking at early ages. To combat this, the Ag Center’s Communities of Color Network continues its mission of reducing tobacco use, consumption, and second-hand smoke exposure among Louisiana’s African-American communities. The CoC Network builds solution-oriented coalitions and provides educational experiences to teach citizens about dangers of tobacco and the industry’s marketing strategies. CoC staff actively participates in more than 14 coalitions statewide and are established many and with more coalitions on the horizon. Regional coordinator Latricia Dixon provided a general tobacco workshop to students at Jackson Middle School. Dixon engaged the children in activities and allowed them opportunities to express concerns about tobacco in their environments. Educational opportunities and interactive activities were provided in Avoyelles Parish where Shawntell Harrell, CoC Network regional coordinator, taught Bunkie Middle School students about the chemicals found in such products as cigarettes, cigars and smokeless tobacco. Paula Jordan, CoC Network regional coordinator, presented a tobacco basics workshop to patients of the Lydia Outreach Clinic, January 20. Jordan provided the group with useful tips on how to keep their homes and kids tobacco-free. She also introduced the tobacco curriculum to Second Baptist Deliverance Church in Eunice, January 25. It was the first of a series of workshops to encourage a 100% tobacco-free church, based on criteria and guidelines established by the Communities of Color Network. The curriculum is customized to fit the needs of Second Baptist. The importance of the workshop was further emphasized when the ministers correlated the message with a biblical passage for the parishioners. Regional coordinator Eric Murphy utilized visual presentations to engage approximately 15 participants at the Adult Learning Center at Southern University, Shreveport, in interesting dialogue concerning the health risks associated with smoking. Program director Linda Early Brown persistently encourages the citizens of Louisiana to seek opportunities to get their communities involved in the initiative provided by Communities of Color Network in tobacco education of Louisiana citizens. “Coalition and educational opportunities are available statewide,” said Brown. Local producers from Louisiana attended the Southern Sustainable Agriculture Working Group’s (SSAWG) 18th Annual Practical Tools and Solutions for Sustaining Family Farms conference in Chattanooga, Tennessee, January 21-24. Forty-five producers, students, extension agents and other agricultural professionals received scholarships from the USDA Sustainable Agriculture Research and Education Program to attend the conference. The conference provided 56 educational sessions, five field trips, five intensive short courses, four mini courses, and a bonus USDA grant writing workshop. The meeting consisted of farm tours and presentations on numerous topics including organic production, cut flowers, pastured poultry, goat production, and farm management. Fifty-year veteran peach farmer Jonathan Jackson, from Shreveport, was accompanied by his mentee Rafeeq Naji on the trip. The duo are neighbors and Naji attended the conference to garner additional information on starting an organic vegetable farm. Jackson invited Naji because he was aware of the benefits associated with the conference attendance through networking with other producers and professionals. Participants expressed appreciation for the networking opportunities at the conference, and many said they were greatly inspired because they received information that would benefit their farming operations and enhance their professional capabilities. “I have learned valuable lessons from the conference by talking to other farmers and attending the sessions. I will start small and expand gradually,” Naji said. Our own Southwest Center for Rural Initiatives assisted with the recruitment and registration of local farmers and agricultural producers and high school students from its 10-parish region to attend the conference. LaVonya Malveaux, Southwest Center director, co-sponsored the trip for Louisiana participants. The group traveled under the leadership of Owusu Bandele, Ph.D., professor, horticulture, Southern University Ag Center, and Carl Motsenbocker, Ph.D, professor, horticulture, LSU. The two professors served as the state coordinators.